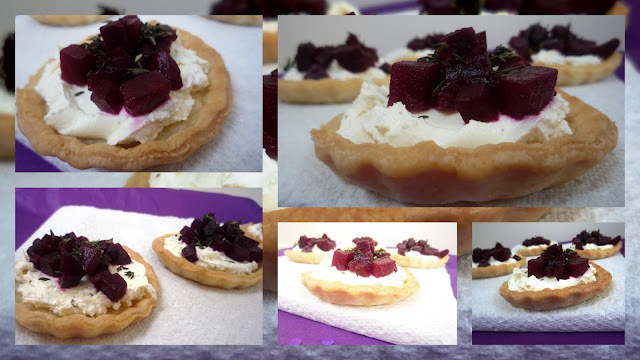 Jagruti's Cooking Odyssey: Cream cheese, Beetroot and truffle tarts ! Few months back I borrowed a cookery book from my local library...Pure Vegetarian by Paul Gayler ! while I was glancing through the recipes a certain picture caught my eye, and I thought I must try this one...because sweet beetroot is favourite of mine, very colourful and healthy...also very easy to prepare and you can make them in advance for party or any other occasion..
Preheat the oven to 190C/375F/ gas mark 5. Roll out the pastry thin and using a biscuit cutter, cut out round twelve rounds of pastry. Line twelve tarts cases with the rounds and cook in the oven for 10 minutes until golden. Leave it to cool. Cut the beetroot into small dice and place in a pan with the vinegar and maple syrup. Cook over a low heat for 4-5 minutes so that they become slightly caramelised and have a sweet and sour flavour. Remove and leave to cool. Mix the cream cheese with the chives and season to taste. Fill each tart case with cream cheese, then top with spoonful of beetroot. Drizzle a little truffle oil over each tart. Ready to serve and Enjoy as much as we did..! the tarts look awesome Jagruti!...I am sure they tasted yummy too!...nice touch of beets with truffles and cream chesse!! Sounds simple and looks very delicious too,my kid would love this! I love love tarts. Must try these. Thanks for sharing! Sounds interesting, would love to give a try. Tarts are looking delicious..beautifully presented too. Tarts looks damn pretty and yummy..
wonderful innovative dish....beetroot in tarts...way to go!!! Keep rocking. so cute and looks delicious..
Looks really delicious and appetizing! What cute little tarts! These would make for an awesome appetizer. How I wish to get back to baking ,,but there is no taker I mean eater..but someday I will re-start..
Sweet beetroot on tarts is new to me...Looks very eyecatchy. so beautifully made and gorgeous presentation. oooh I love cream cheese in plates - looks great! These look awesome. The food you make is inspirational!! cute recipe, can i have some? Thanks for stopping by my blog and your wholesome compliment :)Please do visit often and leave your valuable comments! These tarts look really incredibly delectable! !